Sometimes your professor will give you a citation for an article to track down, or during the research process, you'll find a reference to an article that looks relevant to your project. You can track down the article using several different methods, including using the library search, Google Scholar, or the Journals link. You can view the tutorials for each method at their respective links. If you only know the author's name, you can search by author using Advanced Search in the library search. Choose to search by author and type in the author's name. If there is more than one author, you can type in all of the author's names to help narrow down your search. 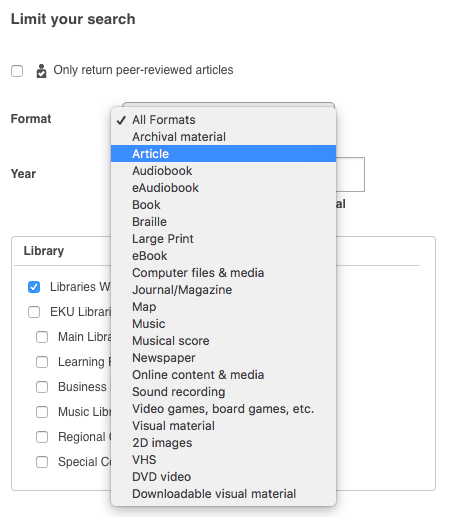 You can also narrow your search by format by either checking the box to return only peer-reviewed articles or selecting "Article" from the menu. If we have immediate access to the article, the record will indicate that it's held by EKU Libraries and will have an "Access Online" link.